Ladders are one of the most commonly used pieces of equipment on a work site. But did you know they can also be one of the most dangerous, if used incorrectly? In fact, falls from ladders are one of the leading causes of injuries in construction — seeing 995 reported falls from ladders from 2011 to 2013. Often the cause is the lack of proper training or that safe work practices are not followed. We use ladders so often that we don’t usually think about how to use them safely. Falls from ladders aren’t just something workers bounce back from either; they usually take a person off the job for an average of 96 days. 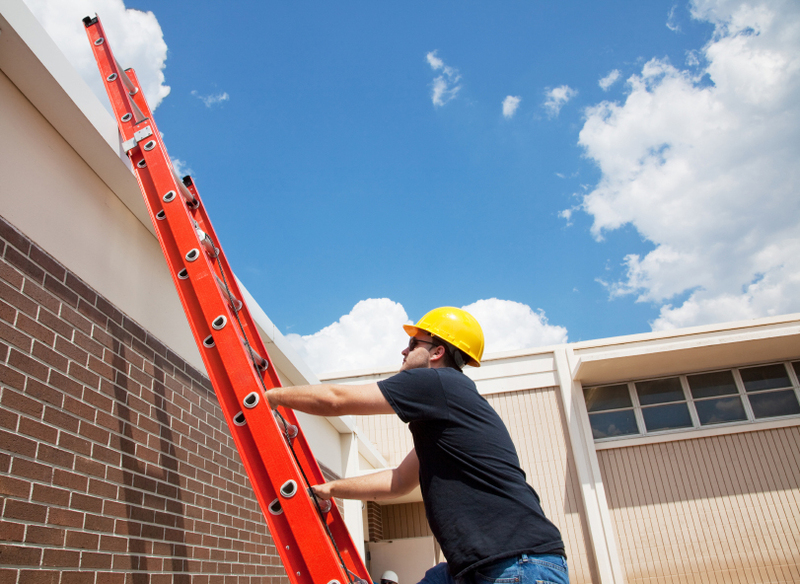 In some cases, falls from ladders can cause life-changing injuries — even death. These serious incidents affect more than just the worker. The consequences can impact their family, their coworkers, the work site, and the industry as a whole. So, before starting any project which may involve a ladder, determine whether a ladder is the best tool for the job? Or would a properly constructed work platform such as scaffolding be a safer choice. If a ladder is used, it’s important to choose the right one for the job at hand. It must also be inspected before each use to confirm that it’s in good condition and strong enough for the job so it can handle the load it must carry. Ensure the ladder is secure at the top and the bottom so it won’t slip and is angled at a 4:1 ratio — for every four feet up, place the ladder base one foot out from the wall. If the ladder is made out of aluminum or has metal reinforcements, it should also be kept far away from electrical hazards. Once the ladder has been properly inspected and set up, it’s important to remember to always face the ladder when using it and to keep your weight between the ladder supports. Need specific tools? Ensure workers make use of their tool belt or use a hand line so they’re able to maintain three points of contact with the ladder at all times. Think only extension ladders are potential hazards? Step ladders may not seem dangerous but serious injuries and even deaths can occur from falling even a short distance from the ground. The same inspection, setup, and usage steps should be followed before beginning work from a step ladder, to help get the job done, safer. Ladders may be an important part of getting the job done on the work site, but nothing is as important as staying safe. No matter what type of project you’re doing, always plan for safety like you plan any other part of the job by making sure you have the right tools and equipment. Don Schouten is the industry and labour services manager for construction atWorkSafeBC. For resources and more information on how to prevent falls from ladders, visit Safety at Work. With our long standing parent company (Archway Construction), Piperun Plumbing grew from humble beginning in 2005 when the need was recognized by the president of Archway.